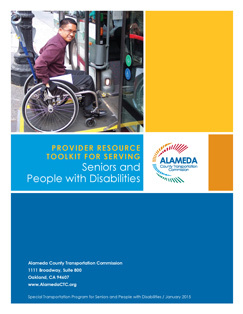 The Alameda County Transportation Commission (Alameda CTC) “Provider Resource Toolkit” consists of web-based and downloadable resources for providers of transportation services for seniors and people with disabilities. The intent of this resource list is to provide education and information on the transportation needs of seniors and people with disabilities, best practices in providing services, how-to guides, performance measures, case studies and other resources that can help providers optimize their provision of services. Please note that while some resources are relevant to multiple topic areas, they have been placed in the topic area that is the best match. Information about local or regional funding sources for accessible transportation projects and program is included in the “Funding” section. This listing of resources is a work in progress, and will be updated and expanded over time. National Center on Senior Transportation (NCST): A broad range of resources and training opportunities related to transportation options for older adults, with focused resources for aging/human services professionals, transportation providers, and older adults and their families. The Beverly Foundation Legacy: On September 30, 2013, the Beverly Foundation completed its program activities and dissolved its operations. The Foundation has arranged to maintain its website, renamed Beverly Foundation Legacy. This online resource contains reports and technical assistance products related to enhancing mobility and transportation for older adults; website includes a Senior Transportation Resource Library and information on Volunteer Driver Programs. National RTAP Website Builder: Website Builder is an online tool that allows providers to create and design transportation websites that are hosted on the National RTAP server free of charge. Easter Seals Project ACTION (ESPA): Clearinghouse for a broad range of technical resources and training opportunities related to increasing public transportation access for people with disabilities. Resources cover topics as varied as travel training, taxi-based services and inclusive pedestrian environments. Project ACTION and its website are funded through December 2014. It is unknown how the website and resources will be maintained past this date. ESPA “Strengthening Transportation for Veterans and Returning Service Members”: ESPA is part of the technical assistance team for the Veterans Transportation and Community Living Initiative (VTCLI), a federal initiative sponsored by the Department of Transportation in partnership with the U.S. Departments of Veterans Affairs, Labor, Defense, and Health and Human Services. Their efforts focus on using the web and open-government tools to facilitate wider involvement and gain greater awareness of the needs of veterans, military families, and service-members. In May 2012, ESPA launched an online dialogue called “Strengthening Transportation Choices So We Can Serve Those Who Have Served Their Country” to share ideas and solutions. National Rural Transit Assistance Program (RTAP): National RTAP is a great resource for small urban transit and paratransit providers. Since many rural providers operate demand-response service, resources from National RTAP often focus on that rather than fixed-route service. National RTAP offers a wide range of training materials, online toolkits, web-based applications, and assistance from a resource specialist with questions and research. California Association for Coordinated Transportation (CalACT). CalACT is the largest state transit association in the U.S. CalACT operates the California RTAP program. This website includes links to resources and announcements for upcoming trainings. ESPA (2012), Effective Transportation Advisory Committees: Creating a Group that Reflects all Community Voices. ESPA (2012), Including People with Disabilities: Communication and Meeting Etiquette. Access Alameda: Updated and redesigned in 2014. Brochure and website providing information on Alameda CTC-funded city-based accessible transportation services, ADA paratransit services, Alameda CTC’s Emergency Wheelchair Breakdown Service, as well as links to Alameda County’s fixed route transit operators. The brochure is available for download in English, Spanish, Chinese, Vietnamese, Farsi, and Tagalog at the Access Alameda website. Alameda County Transportation Resource Finder: Eden I&R and AC Transit partnered to create this online, searchable database of transportation resources available throughout Alameda County. The database is refreshed annually. Aging in Place, Stuck without Options: An analysis by the Center for Neighborhood Technology that ranks metro areas by the percentage of seniors with poor access to public transportation, now and in the coming years, and presents other data on aging and transportation. U.S. Access Board: An independent Federal agency devoted to accessibility for people with disabilities. The Board develops and maintains design criteria for the built environment, transit vehicles, telecommunications equipment, and for electronic and information technology, and provides technical assistance and training on these requirements. U.S. Access Board Accessible Sidewalk Videos: A four-part video series illustrating issues and considerations related to sidewalk access for pedestrians with mobility impairments, including those who use wheelchairs, and pedestrians who are blind or have low vision. Environmental and Policy Change (EPC) for Healthy Aging Initiative: The EPC Healthy Aging online resource provides online presentations, webinars, and resources to build capacity for change. CDC Healthy Aging Research Network & Creating Aging-Friendly Communities: The CDC Healthy Aging Research Network (CDC-HAN) works to develop and implement a national research and dissemination agenda related to the public health aspects of healthy aging. This website provides access to webinars, action briefs and publications. Tri-City Elder Coalition Pathways to Positive Aging: Multi-faceted community planning effort in Fremont, Newark and Union City promoting improved quality of life for older adults. National Complete Streets Coalition: A coalition of groups working to promote development of road networks that provide safe access for all users, including pedestrians, bicyclists, motorists, and transit users of all ages and abilities. The Coalition has a factsheet covering complete streets issues related to people with disabilities. Pedestrian and Bicycle Information Center: PBIC offers comprehensive websites providing information and training on a range of topics related to bicycling and walking and bicycle and pedestrian facilities. PBIC has several resources available relevant to seniors and people with disabilities. Great Communities Collaborative/Great Communities Toolkit: Includes policy fact sheets and handouts on Complete Streets and Senior Mobility. Transportation Alternatives: New York City advocacy organization implementing an innovative “Safe Routes for Seniors Program”. “The Next Generation of On-Demand Senior Transportation.” See Paul Supawanich’s presentation starting at 29:15. (Presentation to TRB Paratransit Conference in Monterey, CA, November 2014). Tri-City Elder Coalition Pathways to Positive Aging: Multi-disciplinary planning project culminating in the development of a Community Strategic Plan focused on quality of life for older adults in Fremont, Newark, and Union City. The plan identifies specific actions and initiatives and engages government, the medical community, the faith community, cultural communities, the private and non-profit sectors, and families and caregivers. Peninsula Fleet Share: Designed to allow cities, agencies, and other organizations in San Mateo County to borrow passenger vehicles when they need them and lend their vehicles to other organizations when they’re not being used. Online resources include: Peninsula Fleet Share Member Guide; Contract Agreement between Peninsula Fleet Share members and the San Mateo County Transit District. ADA National Network (2012), Service Animals and Emotional Support Animals: Where are they allowed and under what conditions? Alameda CTC/CARD Paratransit Emergency Planning Final Report (If you are interested in any of the materials referenced in this report, please contact Naomi Armenta at (510) 208-7469 or narmenta@alamedactc.org). Federal Transit Administration 5310 Enhanced Mobility of Seniors and Individuals with Disabilities: Information about federal funding for transportation programs for seniors and people with disabilities. 5310 and 5317 are now combined in a new 5310 program called “Enhanced Mobility Of Seniors And Individuals With Disabilities.” The 5316 Job Access and Reverse Commute (JARC) program no longer exists as it has been subsumed into the urban (5307) and rural (5311) formula funding programs. Metropolitan Transportation Commission (MTC) FTA funding programs webpage: MTC administers FTA funding programs in the Bay Area. Alameda CTC Gap Grant Program: Funds projects that reduce differences in services based on geographic residence or meet priority established by PAPCO. Public agencies and certain non-profits are eligible to apply for funds. MTC Lifeline Transportation Program: Funds community-based transportation projects that result in improved mobility for low-income Bay Area residents. Public agencies, transit operators, non-profits, and private operators of public transportation services can apply. Projects may focus on transportation needs of low-income older adults and people with disabilities. Administered by the Alameda County Transportation Commission. Beverly Foundation Legacy STAR Awards: Awards supporting innovative transportation programs for older adults. American Public Health Associate Transportation and Health Toolkit: The health and transportation toolkit includes talking points, outreach materials and resources. National Center for Mobility Management: The National Center for Mobility Management (NCMM) is an initiative of the United We Ride program, and is supported through a cooperative agreement with the Federal Transit Administration. NCMM provides assistance to communities through regional liaisons, delivers in-person and virtual trainings, and disseminates research materials and information. National Resource Center for Human Service Transportation Coordination: Operated by the Community Transportation Association of America through an agreement with the Federal Transit Administration, this website provides a range of resources in support of mobility management and transportation coordination. United We Ride: Federal government website supporting development of coordinated transportation strategies. One Call-One Click Toolkit: A toolkit with information for communities interested in working together to develop a one-call or one-click service for transportation. Aging and Disability Resource Center Technical Assistance Exchange. The exchange shares ideas, knowledge, and best practices related to person-centered, self-directed long term services. Metropolitan Transportation Commission (2013), Coordinated Public Transit/Human Services Transportation Plan Update for the San Francisco Bay Area. This federally-required plan details gaps in services for seniors, people with disabilities, and low-income individuals in the nine-county Bay Area, as well as strategies for addressing these gaps. The Plan Update includes new information on existing transportation resources serving transportation-disadvantaged populations in the region, as well as updated transportation gaps faced by these populations. American Public Transportation Association (2008), Mobility Management: A New Role for Public Transportation. This brochure provides an introduction to the concept of mobility management by highlighting case studies and answering common questions about service coordination. Texas Transportation Institute (2011), Performance Measures for Public Transit Mobility Management. Easter Seals Project ACTION Newsletter (2012), Building Relationships between Mobility Managers & Centers for Independent Living. Easter Seals Project ACTION Newsletter (2010), Success in Mobility Management. AARP Public Policy Institute (2009), Mobility Management. California Department of Transportation (2009), Mobility Management Planning Study. National Resource Center for Human Service Transportation Coordination (2007), United We Ride Mobility Management Brochure. MIT Age Lab: The MIT Age Lab comprises over 30 researchers, many of whom focus on the following issues related to driving and mobility: decisions about driving, older drivers and new in-vehicle technologies, health concerns and the older driver, politics and policy around licensing and retesting of older drivers, and transportation alternatives for older drivers. Other research includes topics such as independent living and caregiving and business strategy innovations for the elderly. Little data and information are available on the website itself, however the publications page lists over 45 relevant reports – some are available through links, but most must be obtained through journals. American Automobile Association (AAA) Foundation for Traffic Safety (FTS): Focused mainly on safe driving for older adults. Also provides information related to transitioning older adults into use of other modes of transportation. Understanding elderly driving behavior is essential for crafting a marketing strategy to attract these drivers to public transit. Transportation Network Companies, which provide transportation services using people’s personal vehicles oragnized through web- or mobile-based applications, have begun to address accessible transportation. The following companies should be contacted directly to find out more about their efforts. Lift Hero: Lift Hero matches drivers with seniors in need of same-day transportation. Lift Hero currently operates in the San Francisco Bay Area only. UberWAV: Transportation Network Company Uber now offers vehicles with wheelchair ramps or lifts through UberWAV. As of late 2014, the service was available in San Francisco. Sidecar. Sidecar’s policy is to comply with the Americans with Disabilities Act and in some cities pays into a fund to ensure availability of wheelchair accessible vehicles. Easter Seals Project ACTION, The Americans with Disabilities Act and You: Frequently Asked Questions on Taxicab Service (2005). For consumers; also available in a text version. Transportation Research Board, Research Results Digest 366, “Local and State Partnerships with Taxicab Companies,” (2012) Chapters 4, 5, and 6 (Contracting for Senior and Disabled Demand Responsive Service, Subsidized Taxi Rides, Wheelchair Accessible Taxicabs). National RTAP (2008), START Safety Training and Rural Transit. National RTAP (2011), Customer Driven Service Webinar. National RTAP (2014), 2 The Point Training. Training cards designed to be quick refresher trainings for drivers that can be reviewed in the break room, while parked and waiting for a passenger to finish an appointment, or at the beginning of the day before beginning a route. Association of Travel Instruction (ATI): A national professional association serving the practitioners who teach persons with disabilities and seniors to use public transit safely and independently. Global Travel Training Community: Accessible Web-based community of practice to facilitate collaboration and share knowledge among the travel training community (travel trainers and those interested in travel training). Group members pose and answer questions, and share policies, job descriptions, forms, marketing materials, and other resources. Consortium for the Educational Advancement of Travel Instruction: Enhances knowledge and skills of professional who teach travel skills to persons with disabilities and seniors through in-service courses and published papers. TRB News 278 (2012), Can Travel Training Services Save Public Transportation Agencies Money? National Center on Senior Transportation (NCST), Current Practices Used by Travel Trainers for Seniors. Easter Seals Project ACTION, Mobility Options in Your Community. A resource mapping tool to help you analyze the accessible transportation resources in your community. Disability.gov: An online portal to federal government disability-related information and resources. Easter Seals Project ACTION (2010), Transit Operator’s Pocket Guide. This pocket guide outlines drivers’ responsibilities for serving passengers with disabilities under the ADA. Covers disability etiquette, mobility aids, assisting passengers with service animals and describes the responsibilities that passengers with disabilities have to ensure themselves a ride. U.S. Department of Justice (2005), A Guide to Disability Rights Laws. A 21-page booklet that provides a brief overview of ten Federal laws that protect the rights of people with disabilities and provides information about the federal agencies to contact for more information. Downloadable in English and Spanish, and HTML format; Cambodian, Chinese, Hmong, Japanese, Korean, Laotian, Tagalog and Vietnamese editions can be requested from the ADA Information Line. TCRP Report 158 (2012), Improving ADA Paratransit Demand Estimation: Regional Modeling. U.S. Department of Justice ADA Information Line: 1-800-514-0301 (voice) or 1-800-514-0383 (TTY). Toll-free line for questions about general or specific ADA requirements. Operates Monday through Friday from 9:30 AM until 5:30 PM (eastern time) except on Thursday when the hours are 12:30 PM until 5:30 PM. Spanish language service is also available. National Resource Center (NRC) for Human Service Transportation Coordination/Volunteer Driver Page: This page highlights some of the most effective practices in volunteer and senior transportation, and provides information on developing and maintaining a volunteer driver program. NRC/ Insurance Issues for Volunteer Driver Programs: Provides helpful links to publications and organizations that address insurance issues and best practices for volunteer driver programs. Beverly Foundation Legacy Technical and Resource Materials for Volunteer Driver Programs: This page provides a range of resources related to developing a volunteer driver program. Washington State DOT Volunteer Drivers Guide – A Guide to Best Practices: The guide is a tool kit that provides the framework for developing and maintaining volunteer driver programs. Independent Living Partnership (2013), Risk, Liability and Loss Experience of Volunteer Driver Services: Is the Widespread Belief Warranted that Volunteer Driver Services are Inherently Risky? When Things Go Wrong: A Wheelchair Junkie’s Guide to Wheelchair Servicing. When Self-Advocacy Gets the Repair Done.